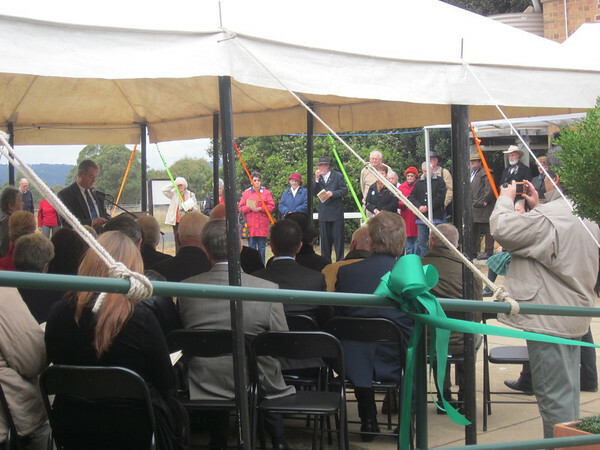 At a ceremony in Sydney in April 2014, several representatives of the Hartley District Progress Association’s 1813 Committee accepted an award from the New South Wales Government. As outlined by Doctor Tracey Avery Head of the Heritage Branch of the Department of Environment and Heritage NSW, the various projects undertaken by the volunteers of the Hartley District Progress Association and the community volunteers that worked with them, represent an outstanding example of a community promoting its local heritage. Our sincere thanks to all who have supported these works, the award is really recognition of a good job well done for all of those who were involved with the various 2013 Bicentenary activities. As there were only 14 similar awards given within NSW, this was an outstanding achievement for our small community. The nomination of the Award for the Lithgow Legend for November has been made by the National Trust Group in recognition of the tireless efforts and commitment given by Kanimbla resident Joan Kent. Joan has contributed many long hours of dedication to her role as a professional historian and since moving to Kanimbla in 1999 she has become involved with many community groups in the greater Lithgow area. As a member of the Lithgow branch of the National Trust Joan has served in a number of positions including secretary and her skills and expertise have been invaluable. Her passion for the work and the objectives of the Trust is reflected through some 30 years as a member, and in recent times Joan has become an individual member of the Blue Mountains Cultural Heritage Association as part of the Management Committee and also as Lithgow’s representative on the Crossing of the Blue Mountains commemoration activities. A significant component of this historical event was a display at the old Hartley School and Joan was instrumental in planning and organising this feature. The display, ‘A Moment in Time’, came as a result of many hours of research and became the focal point of the celebrations. Joan has now written a book based on the exhibition which was launched very successfully at Lithgow Public Library last month. With the significant level of planning that is now under way for the 2015 commemorations of Governor Macquarie’s visit to Bathurst along Cox’s Road across the Blue Mountains, Joan continues to participate as a member of the committee charged with organising this event, and once again her knowledge and passion will greatly enhance these activities. Joan is also involved with the Hartley District Progress Association, it’s School Restoration Committee, and the Hartley Highway Action Group, while still maintaining a deep interest in local indigenous groups, as well as in other heritage sites across the area. When a member of the community becomes involved and gives a commitment, each of us benefits, and the work that has been undertaken over the past few years by Joan Kent is immeasurable. Joan received her award from Member for Bathurst, Paul Toole and Lithgow Mercury Managing Editor, Len Ashworth. Text from Lithgow Mercury, with some corrections to the original text by Diane Green. 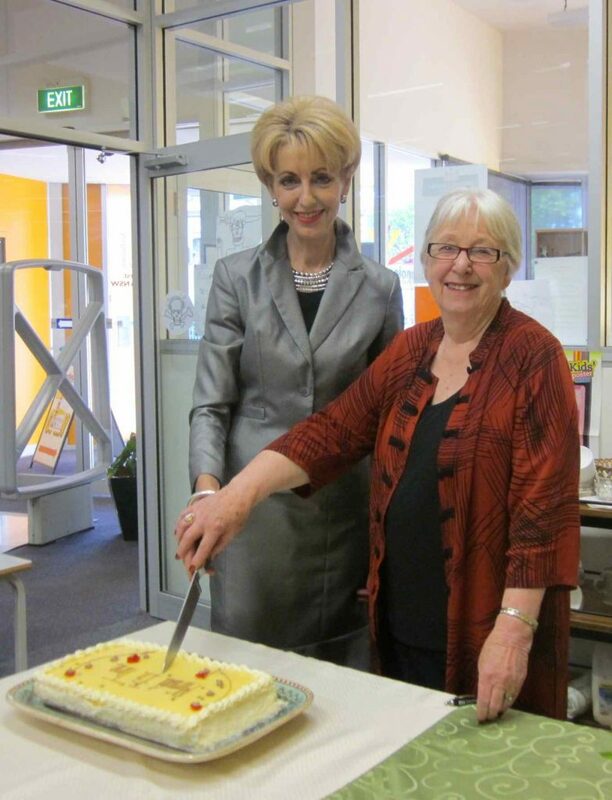 Photo is from the launch of Joan’s book, A Moment in Time – cutting the celebratory cake with LIthgow Mayor Marie Stratham. The Launch, of Joan Kent’s Book, ‘A Moment in Time’, on Friday, 11th October was a great success. Apparently the largest attendance at a Lithgow Library event and a wonderful community atmosphere. The book was formally launched by internationally acclaimed ‘plein air’ landscape artist Warwick Fuller who is also a local resident of the Hartley Valley. It was most appropriate as Warwick’s great great grandparents settled here in 1839, raising 12 children who attended the former SchoolhouseCreek School. Warwick recently accompanied the Australian Royal Visit Party at the personal invitation of Price Charles, who now has four of Warwick’s landscapes in his private exhibition. Warwick’s latest exhibition opened in Katoomba last Saturday. Poet George Clark recited his poem ‘A Moment in Time’ which is included in the book, inspired by George’s visit to the Images Exhibition at the Hartley Community Hall in May and June, which was eloquently reported by your colleague at the time. Ramsay Moodie explained the formation of the Western Crossings Trust, founded to promote an understanding of the consequences and significance of the European Crossings in the expansion of settlement in inland Australia. The Hartley District Progress Association is the Trustee. The book, expanded from the Exhibition ‘A Moment in Time’, was produced by a trio of professionals, research and text by historian Joan Kent in collaboration with internationally reknowned theatre designer Michael O’Kane and graphic artist Kaylene Brooks, all of whom are local residents. It begins with a consideration of the rich and ancient geology of the landscape into which the 1813 explorers intruded, and then moves on to examine many aspects of the crossing story, from the original inhabitants whose country was being traversed, to the development of the Bathurst Road and the first European visitors to Bathurst. It closes with the life and achievements of some of the earliest settlers in the Hartley Valley who settled here in the early 1820’s. The A Moment in Time book, was launched by Warwick Fuller, local resident, internationally acclaimed plein air artist, recently official artist travelling with the Royal Tour of Australia by the Prince of Wales and the Duchess. 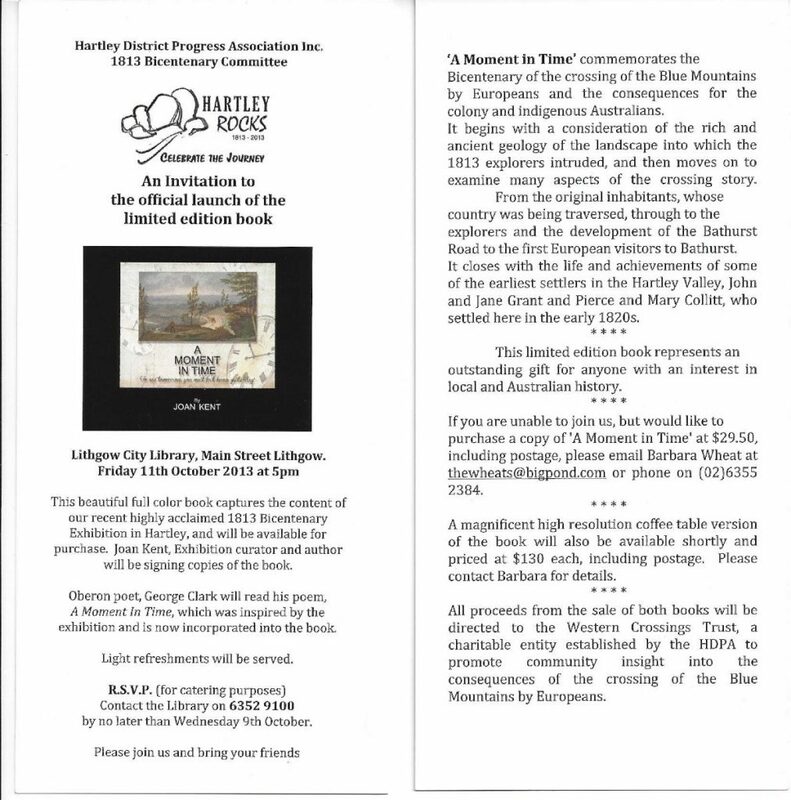 Following its highly successful official opening by the NSW Governor, Her Excellency, Professor Marie Bashir, on 1st June at the Hartley Historic School, is ‘A Moment in Time,’ an exhibition that examines the celebrated crossing of the Blue Mountains by Europeans in 1813, and the consequences of that crossing. Duncan Wass, Chairman of the Hartley District Progress Association 1813 Sub Committee said “ in settling on the name ‘A Moment in Time’, we have tried to capture the essence of the crossing. It was but a moment in time and this is an exhibition that considers what existed before and what came after”. Curated by retired professional historian Joan Kent, now a resident in the Hartley Valley, ‘A Moment in Time’ examines much more than the crossing by Blaxland, Lawson and Wentworth and their party. It begins with a consideration of the rich and ancient geology of the landscape into which the explorers intruded, where ancient sedimentary rocks lie juxtaposed with igneous granite. In fact, the opening display in the exhibition is a most remarkable large mollusc or Brachiopod fossil, that has never before been on public display. Discovered in the Hartley Valley, it nestles in, but is removable intact, from the block of Late Devonian grit stone in which it was discovered. Whilst geology is the opening theme, the exhibition explores many aspects of the crossing story, from the Indigenous Peoples whose country was being traversed, through the explorers and the development of the Bathurst Road, to the first European visitors to Bathurst. It closes with a consideration of the life and achievements of some of the earliest settlers in the Hartley Valley, John and Jane Grant and Pierce and Mary Collitt who settled here in the early 1820s. “This significant exhibition is a comprehensive, sophisticated, accessible and absorbing presentation of that exciting yet poignant moment when the Europeans vigorously fanned out westwards – it’s a must-see amongst Crossings commemorations” commented noted museums adviser Lynn Collins who has acted as an occasional adviser to the project. The exhibition will be open to the public on weekends from 18th May to the 16th June, from 10am ‘til 3pm, and by appointment midweek. Party viewing can be arranged at any time by contacting Barbara Johnson on 6355 2017. The exhibition will be held at the historic Hartley School and Hall located just off the Great Western Highway in Mid Hartley Road, Hartley. 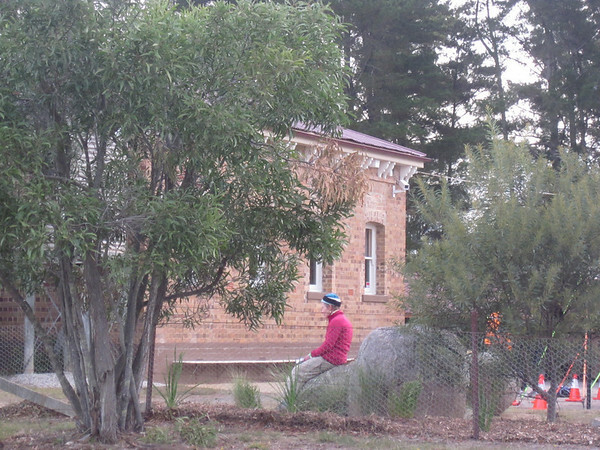 ‘ A Moment in Time’ is just one element of the commemoration activities the Hartley community is undertaking, all promoted under the ‘Hartley Rocks’ logo. Other activities include guided walks and rides along the line of Cox’s 1814 road through the Hartley Valley, and a project to date sign many of the heritage assets located within the valley. The Cox’s Road walk represents a unique opportunity to walk some of the country traversed by Cox and the explorers, much of which is located on privately owned land and is not normally accessible to the public. Click on the image below to access more photos taken at the official opening of the Exhibiton, A Moment in Time by Her Excellency, Professor Marie Bashir on 1st June.